MOSCOW, August 10. /TASS/. Denmark received additional application from Nord Stream 2 for the construction of the gas pipeline, which offers an alternative route, Head of Media Relations at the Danish Energy Agency Ture Falbe-Hansen told TASS. "We have received the new application today and now we have to study it," he said. Denmark has not yet granted Nord Stream 2 permission to lay the pipeline through its territorial waters. This issue is being considered by the country's Ministry of Foreign Affairs. 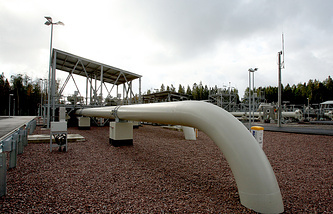 The operator of the Nord Stream 2 gas pipeline project has applied for an alternative pipeline route in Denmark, according to the press release "Submission of Application and Environmental Impact Assessment for an Alternative Route in Denmark" published on the project’s website. "Today Nord Stream 2 AG has handed in an application and Environmental Impact Assessment (EIA) report to the Danish Energy Agency for a route passing through the Danish exclusive economic zone (EEZ) to the north-west of Bornholm. This is an alternative route that does not pass through Danish territorial waters," the press release said. The Nord Stream 2 project is an expansion of the existing Nord Stream main gas pipeline linking Russia and Germany. The pipeline is set to run from the Russian coast along the Baltic Sea bed to the German shore. It will bypass the transit states - Ukraine, Belarus, Poland and other Eastern European and Baltic countries. The gas pipeline will pass through the exclusive economic zones and territorial waters of five states - Russia, Finland, Sweden, Denmark and Germany. The pipeline is expected to come into service at the end of 2019. The operator of the gas pipeline construction project is Nord Stream 2 AG, with the only shareholder Gazprom. Gazprom's partners - German Wintershall and Uniper, Austrian OMV, French Engie and Royal Dutch Shell (Great Britain and the Netherlands) - will finance 50% of the project.